Radiohead's longtime drummer, Phil Selway, brings in such technical adeptness and such unusual patterns and time signatures that he become much more than a time-keeper. In 2001, Selway collaborated on Neil Finn’s supergroup project, 7 Worlds Collide, in the process meeting and playing for the first time with many of the musicians (including Lisa Germano and Wilco’s Glenn Kotche) that wound up playing with him on his solo debut. Familial starts out slightly spooky, like Radiohead, but quickly becomes its own creature, layering its creaky rooms full of hushed folk singing with barely perceptible electronic flourishes. The A.V. Club recently sat down with Selway to discuss his love of Will Oldham, how long it took him to find his voice, and why watching Kotche play is like watching John Cage in action. The A.V. Club: You’re one of the four people in Radiohead who has significant extracurricular activities outside of the band. Radiohead is such a big organization, with so many people working for it—when you approached this album, was there a vacation aspect? 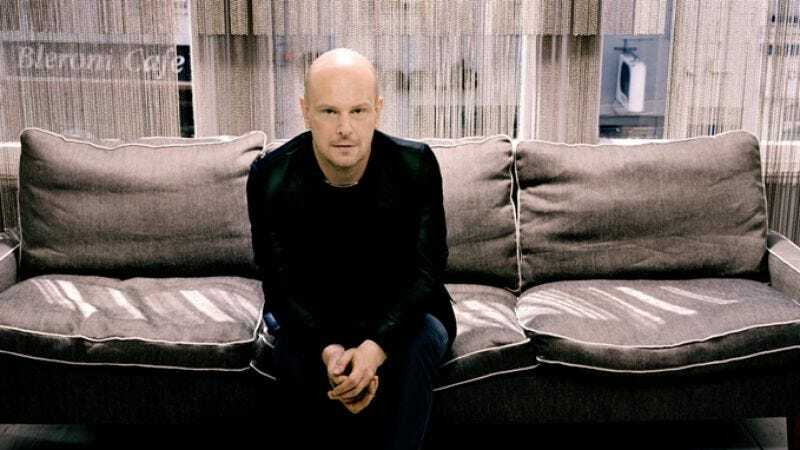 Phil Selway: I suppose whenever we work, we try to not think of it in that kind of “large organization” thing anyway. The way we work—yes, there are meetings for getting that sense of all of us working together, but also allowing spacing in the schedule. When we’re away from it, we aren’t away from it. There are these bursts of time where we’re working intensely on stuff together, but we put wide lines outside of that. So actually going off and doing this solo stuff, it’s whatever else is going on in people’s lives. It’s kind of all that stuff that feeds back into Radiohead. As you say, there are a lot of people involved in that process in one way or another, but we try to keep it as low-key as possible. That side of it takes you more and more away from your sense of humor and your genuine voice. AVC: How does this album feed back into Radiohead? PS: I think in terms of stretching my music. Things that I wouldn’t necessarily do in Radiohead, because there are people who already do that anyway. PS: Writing songs. [Laughs.] But also, everybody plays guitar, which is great, so for me, I just get to concentrate on the drums. Playing more instruments has given me a chance to feel comfortable. Also, anything that improves my musical know-how is going to feed back into Radiohead. Scratching some of those musical itches that probably wouldn’t work in the context of Radiohead, because there are things that aren’t appropriate for that place. So yes, I developed more as a musician after it. I think I nipped any frustrations as well, the kind that could come from working together after two and a half decades. It’s just that sense that the process is still growing, rather than thinking that I’m working within this framework which was established back in the mid-’80s. Part of that framework is a very good mentality that we have the security to go and do this other stuff. And it’s fascinating. I’ve not seen Atoms For Peace live, but listening to the arrangements and seeing Atoms For Peace on YouTube, and watching what Thom [Yorke] is doing there, it brings out a completely different side of him, or Jonny [Greenwood] doing his soundtracks. It’s fascinating, because you get a greater sense of these people as broader musicians. Sometimes you need to step out of it to actually—I suppose sometimes in a very established relationship, there will be some ceilings that are difficult to break through in that context, and to see people do things outside of it, you get a greater sense of who everybody is. AVC: When did you realize you wanted to do your own solo work? PS: When I first started playing drums, that’s when I first started playing guitar, so the seeds have been there from the outset. When we started Radiohead, I just wanted to concentrate on the drums, but it’s always been in the back of my mind. It’s always been one of those things I wanted to do in the future, and then I found myself around the age of 40 and thought, “It’s now.” I’ve actually been feeling ready recently, having the confidence to do that. AVC: Do you think you could’ve done it 10 or 15 years ago? PS: No, not at all, really. I hadn’t gone through that process of trying to find my singing voice, and trying to make it a convincing thing to listen to on record. I suppose at the time, I was trying to do something distinctive in drumming terms, and that’s kind of where that was all channelled into. That was kind of the challenge at the time. And it’s also perhaps finding that I ought to step out of an established role. I think I needed the resilience of approaching my late 30s to come to terms with the resilience I required to learn to sing. AVC: When did you start working on your singing voice? How did you go about that? PS: It’s been a long process, really. I suppose as I was coming round to the fragments of songs and music coming through, and rather than thinking about the singing voice, it was something where I get the melody lines out. So it wasn’t to sing to anything at all, it was just purely functional. If I was putting anything down, it was for a dictaphone. That’s what it was, but it was very quiet. So I suppose it had its seeds in that, and then I decided I actually wanted to learn and push further. I had singing lessons for a while, which was actually very useful in terms of learning technical stuff. Then came working with Ian Davenport as a producer, and actually having that time and space in the studio to try out lots of different approaches, and eventually find something which felt as if it was appropriate to the songs emerging in the background. And that was really a process of trial and error. “Beyond Reason,” the second track on the record, was the first time something came together which I thought, “Oh, actually, that sounds all right. That sounds… I can listen to that.” Listening back to your speaking voice for the first time, unless you’re James Earl Jones, it’s a quite distressing process for most people. So that was the first time I didn’t cringe listening back to my singing voice. AVC: But you’ve been singing backup vocals too, right? PS: It’s a different thing, though. That’s all about singing in tune. AVC: And projecting a bit more? PS: Yeah, but I’m not the front of it. The front end of that is Thom. I’d say he’s really got this amazing voice carried out there. And I’m just vanishing with the arrangement. So it’s not at all about my voice. It’s just something that’s very mutual, that actually sits in with that. For this, I had to find to find my own voice. That’s a completely different process. AVC: You have a list of collaborators on Familial who are songwriters and musicians, all experienced at collaborating. What did you ask them to bring to it? Is it a top-down thing, or more of a group environment where they contribute? PS: Well, I have the songs. And I sent my acoustic demos out to everybody. I was also aware that within that, everybody had a distinctive musical approach and voice, from having worked with them briefly on the 7 Worlds Collide project. That was a really nice blend of musicians. So I presented the songs, came into it with a very open mind, and everybody agreed to it. And we were working quickly, so for me—if there was kind of one thing, one guiding principle in it for me, it was actually maintaining that space, trying to find those bits of delicacy, and different layers among them. AVC: You’ve said the actual recording process went quickly. PS: Yeah. Absolutely. I mean, some of it had been working on demos with Ian for a while. But all these musicians have very full schedules. So I knew this, confronting that. We had a fortnight together last September, so we had to work quickly. AVC: Did you try to do as much of it live as you could, or did you cut it track by track? Sometimes the little squeaks on the floor are audible. There’s a nice mix between the electronic embellishments and the feeling of space in the room. PS: It has a kind of electronic-y aspect, we could debate it in that context. But I was very keen to—I felt like it breathes life in that performance, that sense of the room around it, a sense of the time and place. I love people’s records where you do hear the creaks. You do hear the ambulance driving, something like that. Rather than the sense that this was crafted in the studio, where it’s just that. Here, there’s something actually engaging—you’re actually caught up in it. AVC: Are there any records of that kind that you find particularly compelling? PS: I’ve always loved the approach of Will Oldham. I listen to Master And Everyone, or The Letting Go—I mean, the record he did with Matt Sweeney [Superwolf] is not super-popular, but that’s the one. All of those things—you hear the wind howling outside, and your lips are up against the microphone, and you’re shifting on your seat. As opposed to a record where—it’s actually quite an intimate record, where you get the sense that somebody actually sat there, and you’re right in the middle of that process, rather than having that stage detached by the time it gets to you. AVC: You conspicuously avoided drumming, which is your day job. Was that built in from the conception? PS: It was. I mean, chiefly because I didn’t need drum parts as I was writing the songs. I drummed one song, “A Simple Life,” and that’s a very me drum part. But the rest of it, until I met Glenn, I really didn’t think drums would work on there. PS: It’s amazing. Nobody else does that. It’s almost like he prepares the kit like a piano—he does the same thing to a drum kit, so you get all these patterns, all these textures coming off, which all sounds programmed. But he’s doing it in real time. And you’re trying to program that stuff, but with Glenn, that just happens. Very percussive, experimental approach to playing his kit. If Jonny chose to play drums, that’s who he’d end up playing like. AVC: What did he do on the record, though? PS: Oh, right! [Pause.] Umm… “Broken Promises.” Which has these subtly shifting rhythms going through that sound very percussive to me, that sound almost programmed. And if you take them in their own right, it’s just like these amazing percussionist solos, most of which is very fine detail, with these gossamer-thin layers going through. So he would play a pattern on the kit, he’ll put all manner of strings or chains over the kit, or blowing into drums so the heads will expand. So those real-time sound effects on the kit, he does them. AVC: There’s been sort of been a resurgence of British folk in its revivalist aspect, and also still the hangover from more electronically oriented folk musicians like Adem. Was that something you thought about when you were starting the record? The simplest way to classify it is as a British folk variant. PS: Right. Very much. For me, the folk’s almost tapping into some older tradition, which this one doesn’t feel as though it is, so it’s not faithful in that way. Adem figured in my mind when I started to think about recording, along with Juana Molina and Lisa Germano, Beth Gibbons, and so on. AVC: When it came time to write lyrics—had you written before? PS: I hadn’t for a very long time. The last things I had written were as a teenager. So when I came back to start writing again, that was naturally my starting point. And for a while, what I was writing, the language ran true, but on the whole, it didn’t feel as though it was going toward a new song, so that took a while. There’s a lot of things involved in making these records. It was kind of learning how to make a record from the ground up, even though it’s something I’ve done for decades. I was coming at it from such a particular angle with Radiohead, and I wasn’t doing that with this record. So it was setting myself the task of “How do I make a record? How do I write and go record a record? What do I need to learn to do that?” It was learning to do things, learning to be at the center of it as well. AVC: It sounds like it took a long time to prepare before you started even recording demos. How long do you think the album as a whole took to gestate? PS: About seven years. Fragments—musically, songs would come together, so it was full-bodied in terms of the music. The penultimate track, “Don’t Look Down,” I suppose that one’s musically been hanging around my head for a while. But chiefly, the real process started about seven, eight years ago. And then three or four years ago, it really started in earnest. Songs started to flesh out and come along. Then it started the process of sifting through what I was writing, and figuring out which were the ideas worth seeing through. AVC: Did that sifting take a long time as well? You have to learn how to judge your own work. PS: Yeah, exactly. And I think that’s where it’s really useful to collaborate with other people. I started working with Ian Davenport, who produced it, with Lisa and Sebastian [Steinberg] and Glenn and Pat [Sansone], because then I could see which songs they responded to, having that reflected back at me. I also tried to apply the same kind of levels of critique in Radiohead. AVC: Radiohead has also had some famously difficult, long gestation processes. PS: Yeah, for that reason. But it was trying to apply that similar level of critique to what I was doing. But also, when we do that in Radiohead, there’s five of us, six with Nigel [Godrich], and then actually being kind of the central person in that and making the final decision. That’s quite a thing, you know? Then you have to have the courage of conviction in your taste. AVC: How’s the new Radiohead record coming? Do you know yet how you might put it out? You’ve come to be one of the symbols of the death of major labels. PS: You just can’t decide to do that, really. I mean, I spoke with those guys about how that approach captured imaginations, but at that time, it just felt like the most exciting, appropriate way of getting the music heard. Whether we’ll do that again, I won’t know until we’re finished with the record, Once we’ve finished with the record, which we’ve not yet, then we’ll get a better idea of what’s appropriate for the record. AVC: When you’re writing lyrics, is there a certain level of guardedness that you like to keep about the amount of information you could extrapolate? PS: I suppose for me, I think the most important thing is to do this with genuinely my voice, to have the imprint of me there. I’ve spent a lot of time working with lyrics, and going through that process, there’s a sense of working through songs, so that there’s a resolution of actually writing it by the time I get to the end. I suppose the way I’ve been brought up, it’s not really polite to talk about yourself, so this is kind of—although it’s not specifically talking about me, there’s a lot in there, so it’s felt a little strange.